Let’s face it, nobody likes going in an outhouse. Those of us that have one understand that it’s a necessity and we quickly move past the smell and the bugs and the gaping black hole beneath us. Since I’ve been an outdoor lover all my life, I have memories of going in some really rustic ones (which is the polite way of saying “entirely neglected, nasty, falling apart shitholes”. Pardon the language.) or on long hikes, just going in the woods. It takes some getting used to. But I will take these more natural settings over some public toilets I’ve had the misfortune of seeing, any day. The one that we got with the cabin was actually in really good shape. Though the cabin and its accompanying buildings had fallen into disrepair within the last few years, it is clear that our little cabin was at one time dearly loved. 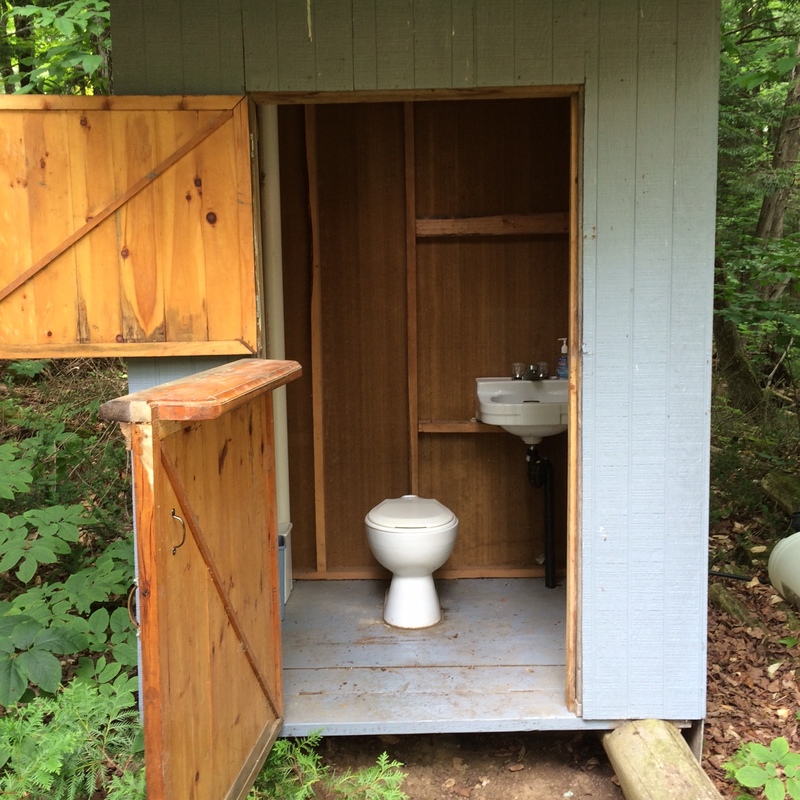 The outhouse was structurally sound, built from rough lumber and fibreboard and painted a light blue colour. It has a dutch door, which might be considered exposing to some but considering the outhouse is behind the cabin in a shelter of trees, it is quite often left open to let in light. Speaking of light, it has a skylight as well. It has a white porcelain toilet in it which makes it feel a little more inviting right from the get-go and a porcelain sink that is a remnant of a rain barrel system that we hope to resurrect one day. It even had a standing chrome toilet paper holder. See? Not that bad to begin with. But …still an outhouse. But it is still an outhouse and I noticed very quickly that the outhouse and the lack of running water (ie: bathroom hygiene concerns) is the number one factor in whether someone actually makes the effort to come out to our cabin. The challenge was before me: how to make the outhouse a place where people wouldn’t mind going. 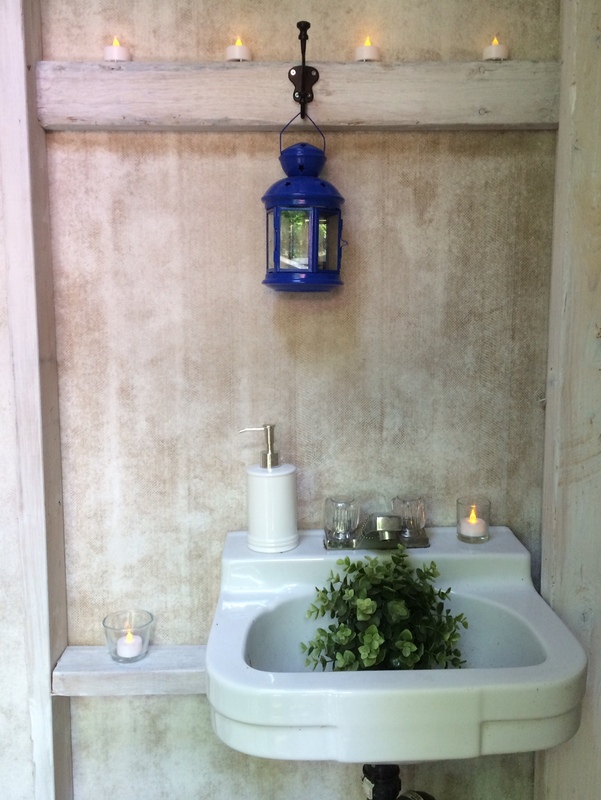 So I checked out Pinterest and I was inspired by the outhouse this blogger built. Awesome sauce. I was not interested in actually building anything new into our outhouse but I knew a fresh coat of paint and some decorative accents would make a difference. First things first. Rid the outhouse of wildlife. The bee? Gotta go. Sorry dude, but we are reclaiming our space. The wolf spiders? Outta there. Can’t tell you how many flyswatters I mangled trying to kill these mo-fo’s. Next, paint the walls. It’s an outhouse – 4’x4′ at most. How long could this take? I’ve got half a gallon of white paint, I’ll mix it with rain water to get the desired whitewash look and voila! Beauty! Two hours max. In the end, after hours of painting and repainting, I finally got the look I was hoping for. The next day, the walls had completely dried and it seemed like I had put hardly any paint on them at all. So I did it all again, this time using a far more concentrated mixture with just the brush. I brushed the mixture on haphazardly, trying to make an uneven, distressed look using a mostly dry brush to push and smudge the paint around. It turned out wonderfully in the end but man, that was way more work than I was hoping to put into painting an outhouse. Now that the walls were finished I could add in the decorative accents that would finish it off. I had two artificial plants at home from Ikea that I brought out. The artificial plants from Ikea are inexpensive ($5 – $7) and quite nice looking. I bought a set of three small tin plant pots from Dollarama for 3$ and the plants fit perfectly in them. I found a white soap dispenser from Value Village for $2 for the hand sanitizer. I had also found a white box to put a tissue box under that I thought would be nice. But when deciding what to put in an outhouse, one must always consider what sort of creatures might think it was a good home. The thought of lifting that tissue box cover to find a wolf spider or a bee has made the perfect home inside it did not fill me with warm fuzzies. 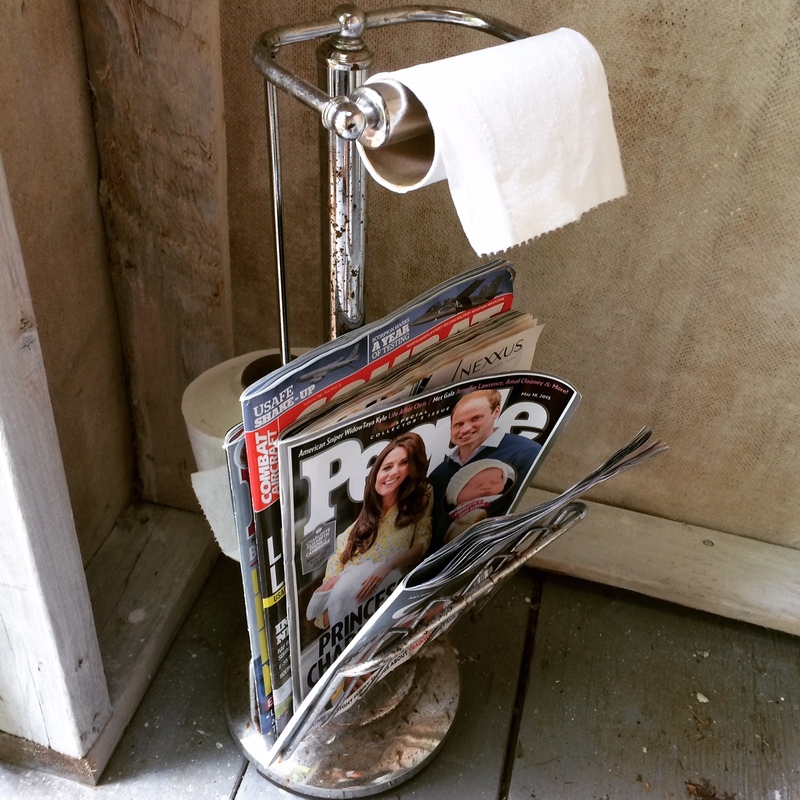 I added some magazines and an extra roll of toilet paper to the tp holder for longer stays in the privy. Extra toilet paper and something to read for longer stays. 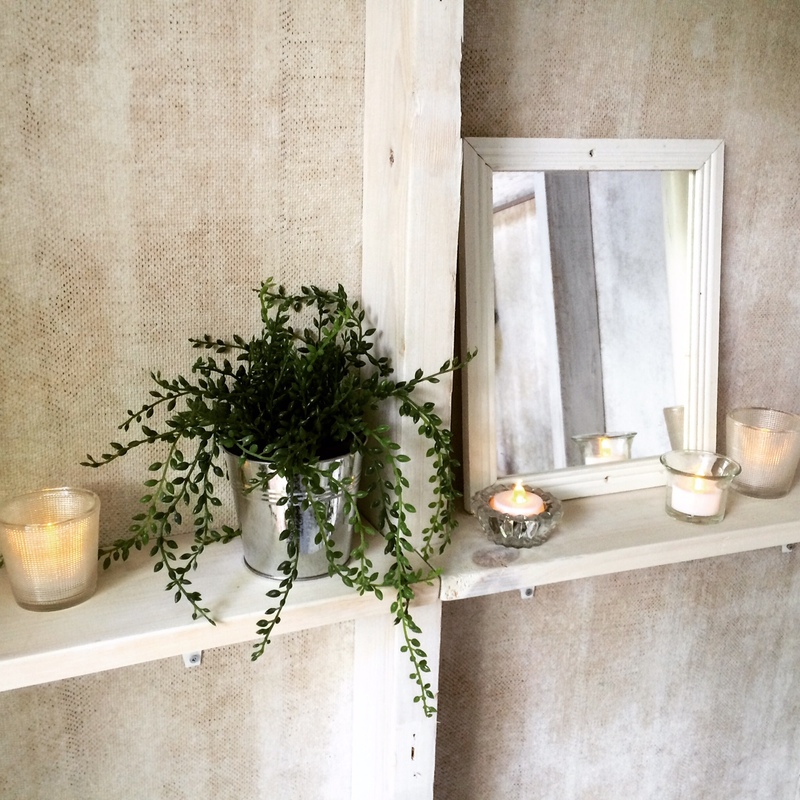 Tea lights and a small mirror add brightness. I wanted to add some shelves as well as there was nowhere to place anything except on the sink. And as you can see, that’s not a great amount of space. If you’ve ever worried about dropping your phone in the toilet then consider for a moment the tragedy of dropping your phone into the outhouse toilet. ‘Nuff said. Soldier Boy was beyond excited that I gave him the job of building shelves. He is still on crutches and being forced to just sit around and watch my DIY madness is not fun. 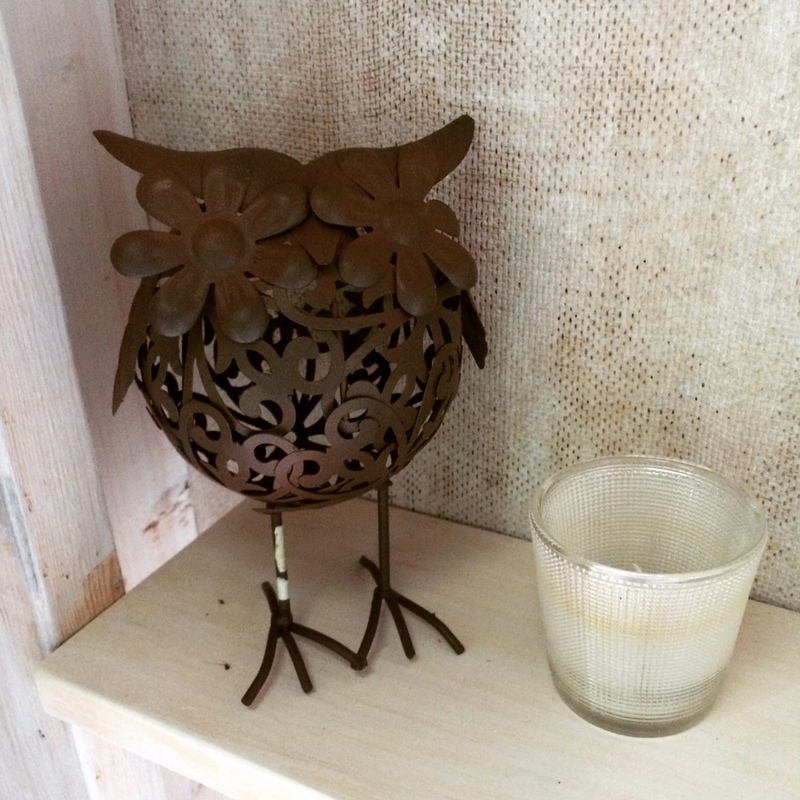 He did such a great job that I think I’m going to get him to make more shelves so I can add a few more tealights. I’d also like to make a fun sign that lists some “Outhouse Rules” and put it in a white frame on one of these to-be-built shelves. I added numerous electric tea lights and a small mirror to add a warm light. Summer days are long and campfires and drinks can go long into the night. This structure does have the dutch door as well as a skylight which makes it brighter than the average outhouse during the day but the warm, yellow light of candles gives it a soft glow as the sun fades. 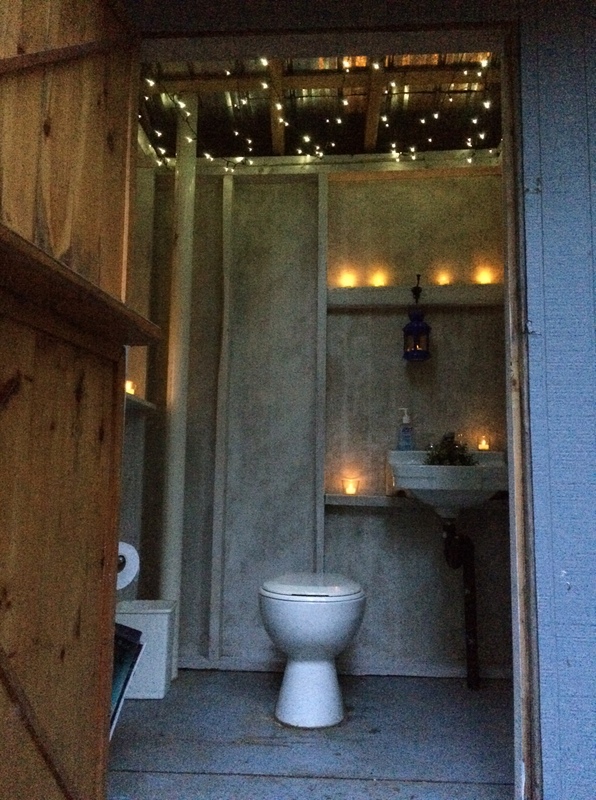 We found a 100-light string of solar fairy lights from Canadian Tire on sale from $50 to $30 that I stapled back and forth across the top of the outhouse to add even more light. I am happy to say that the idea was a success. From our firepit, if the top door is left open, you can easily make your way to the outhouse without your headlamp. And when you are in it (top door closed), it is nicely lighted and comfortable. Even though we had to mount the small solar panel for the lights on the roof of the outhouse in the shade, it still charged enough for the lights to stay on almost all night. The final touch is the ash and sawdust bin. There are two tricks to keeping the smell of an outhouse within non-toxic parameters – keep the lid down and put a spoonful of ash or sawdust down the toilet after you use it. Not only does it help break down the waste faster but it helps keep the foul odours to a minimum. 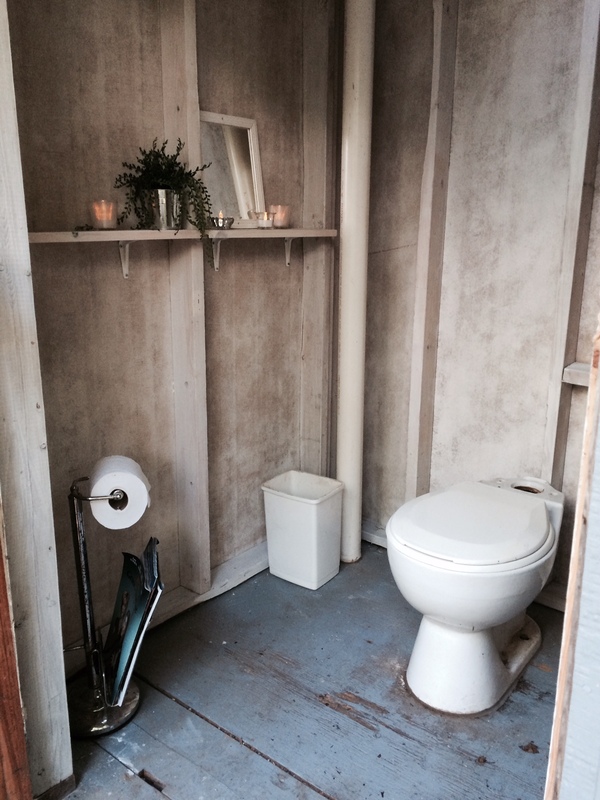 So, after two days, I had transformed the crappy crapper into a pretty privy. And when I finally finished, I was lying on the couch, with ice packs on my shoulders and a bottle of wine close beside me. I can’t guarantee that I’m going to get more visitors to our cabin because of the makeover. After all, it is still an outhouse. But I am certain that those who do brave it, will at least appreciate the effort put into making it more comfortable. Great job on your outhouse! Thanks for linking back to my outhouse too 🙂 LOVED your video! It is sooooooo true, as with most projects…you imagine that it will take no time at all and it takes f.o.r.e.v.e.r. Crazy, but worth it. Happy DIYing !! Great job on the outhouse and your blog. I’m really enjoying your posts. We will be making an outhouse but if it takes as long as it is taking to do the roof it will be awhile. Glad you are enjoying it, Anna! All these projects are so much fun (and of course, a little frustrating, but that’s only normal.) We sooooo need to talk about roofs.